June 12, 2012 - Cessna Aircraft Company announced that it signed a purchase agreement with NetJets for delivery of up to 150 Citation Latitude business jets, with initial deliveries beginning in 2016. NetJets, offers fractional ownership and rental of private business jets. Cessna and NetJets have had a more than 20 year history working together to provide high quality, safe and reliable business travel to NetJets’ customers. Currently, NetJets owns and operates more than 250 Citations including the Citation Encore, Citation XLS+, Citation Sovereign, Citation X and soon the Citation Latitude. “We are very excited to enhance our longstanding relationship with NetJets by producing the Citation Latitude for them and their customers,” said Cessna President and CEO Scott Ernest. First announced at the 2011 NBAA Annual Meeting and Convention, the Latitude has been designed with space for a crew of two plus up to eight passengers; features Garmin G5000 avionics; includes an 84-inch fuselage; a 6-foot high passenger cabin with a flat floor; and Cessna's highly advanced ClairityTM cabin technology solution. 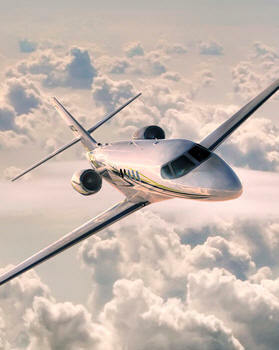 Positioned between the Citation XLS+ and Citation Sovereign in Cessna's product line, the Citation Latitude design, at a current retail price of $14.9 million, offers a full fuel payload of 1,000 pounds, a maximum cruise speed of 440 knots true airspeed and a range of 2,300 nautical miles. Preliminary specifications project that the aircraft will operate at airports with runways as short as 3,900 feet, will have a maximum altitude of 45,000 feet and will climb direct to 43,000 feet in 26 minutes. First flight of the Citation Latitude prototype is expected to be mid-year 2014, with FAA certification (Part 25) and entry into service expected in 2015.